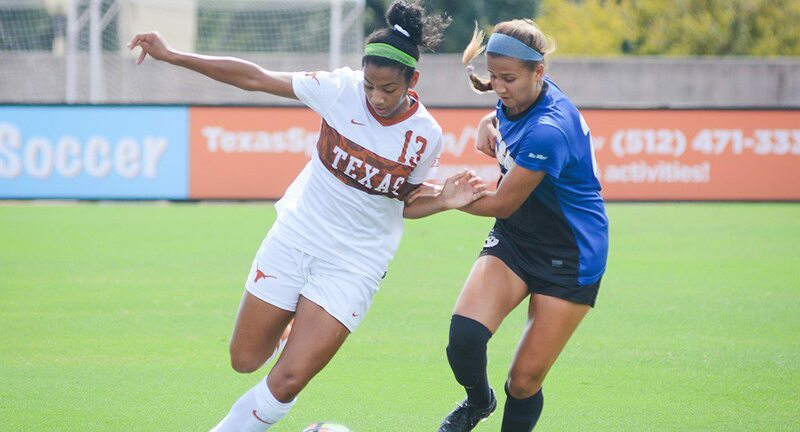 Freshman forward Cyera Hintzen's second goal of the season was not enough for the Texas soccer team, which lost, 2-1, in overtime at Oklahoma (photo courtesy of texassports.com). NORMAN, Okla. — Freshman forward Cyera Hintzen gave the University of Texas soccer team an early 1-0 lead, but the Longhorns were unable to make the score hold up, falling in overtime at Oklahoma, 2-1. With the loss, the Longhorns fell to 6-4-1 overall, and 0-1-1 in games against Big 12 opponents. Hintzen scored in the ninth minute to give the Longhorns a lead that would hold up for about 77 minutes. But OU’s Rasha Roberts scored her first goal of the season to tie the game in the 86th minute, forcing overtime. Lizzie Luallin then scored her second goal of the season with just 29 seconds remaining in overtime to give the Sooners the victory. The Sooners outshot the Longhorns, 23-15, including an 11-5 margin in the second half, but Texas held a slight 8-7 edge in shots on goal. The Longhorns took eight corner kicks, compared to just three by the Sooners. Katie Glenn led the Texas with four shots (two on goal), while Hintzen, Alexa Adams and Kayra Dollas had three shots apiece. Dollas had two shots on goal, while Hintzen and Adams had one each. Senior UT goalkeeper Paige Brown had five saves in the loss. The Longhorns now return home to Austin, and will host Oklahoma State at 7 p.m. Friday in a game that will be shown on the Longhorn Network.